With the announcement of the new GeForce GTX 560 video card yesterday (I hope to soon be able to do a quick test to see how it performs in stereo 3D mode with 3D Vision), Nvidia also made available a new beta version of their drivers with some interesting new features that go along with the typical and expected performance gains. An interesting thing regarding performance improvement in the new drivers is the claimed increased gaming performance by up to 12% for dual-core CPUs in CPU-limited cases. 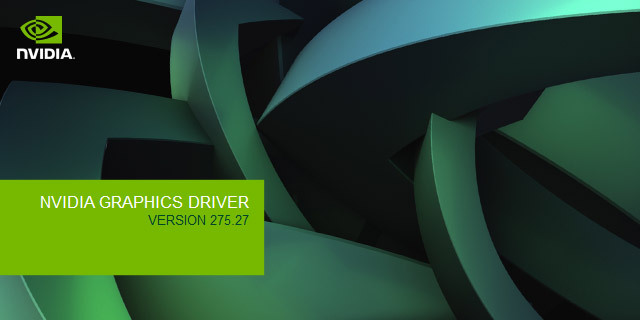 The new GeForce driver 275.27 beta also comes with further improved Nvidia Update functionality, so that it now also not only notifies of new drivers being made available, but also can download and install automatically SLI multi-GPU and anti-aliasing (AA) profile updates. The new driver package includes version 275.22 3D Vision Controller driver, so you don’t need to download and install separately anything in order to enable the IR emitter and make 3D Vision work as it should, and apparently there is also improved 3D Vision IR emitter and 3D Vision glasses synchronization (not sure if this will lead to reduced crosstalk or may be addressing some issues present with AMD processor based PCs). The new driver also adds support for 3D Vision Photo viewer in Window Mode (check the View option in the player), and it adds support for one new 3D Vision-ready projector – the NEC NP-V300X series. The new GeForce driver version 275.27 adds the following 3D Vision game profiles: Age of Empires Online, Battlefield Play4Free, Super Street Fighter IV and World of Tanks. It also has an improved profile for Portal 2 with fixed water reflection problem and updated convergence setting to provide a better user experience, as well as an improved profile for the The Witcher 2 that should provide better 3D Vision compatibility for all in-game effects. @Kris I actually uninstalled 3d vision from my pc and it gave me about an extra 25 fps. apparently having 3d drivers installed on your pc and not even using 3d vision severely destroys the framerate of the witcher 2. hopefully this is fixed soon. either way the game is beyond incredible. No need to uninstall the drivers to get the fps boost in Witcher 2. just disable the 3DVision service and it will do the trick. Less pain this way if you want to still use the 3D. @Pat. No disabling the 3D vision from Control Panel doesn’t fix it. Anyone tested this with the official WHQL drivers? prior to profile update? AMD user here and no problem at all with this drivers. Some problems with an Optoma HD67 are fixed, and ghosting very improved in my Acer GD245HQ. For me crosstalk and ghosting are far worse than ever in Portal2, but water surface seems ok ! (acer GD245HQ, intel i7 930, 2 GTX460-1Go SLI). I am using a DLP HDTV. This beta and the last have not worked for me. The previous Beta caused my 3d vision emitter to turn on and off. This current beta caused a flickering effect and the 3D would never sync with the glasses. I am still at 267.64 as the last one to work properly on my DLP. Likely just a DLP issue though. Portal 2 looks perfect with Tridef portal profile. I used driversweeper (from Guru3D) to remove the previous Nvidia drivers before installing the 275.27 drivers – 3D now much more reliable and frame rates in Serious Sam HD have shot up. GX460 1Mb Core2Duo 3.6Ghz, Win 7 64 bit. Huge improvement on previous drivers but MUST first uninstall old ones to get the benefit. Overwriting just screws things up. – hope it’s not against the rules to post links. It is freeware. – that seems to be working ok. Viva Google. Nvidia is apparently working on the indoor frame rate issue but who knows how long that will take until we get the driver for it. I just finished Act 2 of the game and I think I only ran into that indoor frame rate issue once or twice briefly in that part. I will probably do my second playthrough sometime later after the issue has been fixed. Aside from some annoying things like a ballooning save game folder and need to keep all formulas and crafting diagrams in the inventory, it is a fantastic game and looks great in 3D. That, i didn’t expect i must say. Those of you who have purchased 3D Vision clones from eBay, will be surprised to find out that the emulated USB dongles are not functioning anymore with the new Nvidia 3D USB stereoscopic controller driver. I did a lot of testing. I also tried to “force” an earlier USB 3D controller driver (266.58) to be used with the new Graphics Driver (275 release) but unfortunately although 3D Vision gets activated through NVIDIA control panel, when you try a game or a 3D movie, everything shows in RED CYAN anaglyph. Although it’s in 3D mode with my 120Hz monitor selected, it somehow reverts in 3D Vision Discover, with the USB dongle deactivated. The only workaround is to revert back to 266.58 drivers. For most of the community this news isn’t important but for some it may be. For example i have bought 4 pairs of 3D Glasses wired and the dongle for the price of a single Nvidia 3D Vision Kit, so it really hit me when i found out that after updating my drivers, the clones were not working anymore.